Establishing the hierarchical order among XML elements is an essential function of XML query processing techniques. Although most XML documents have an associated DTD or XML schema, the document structure information has not been utilized efficiently in query processing techniques proposed so far. 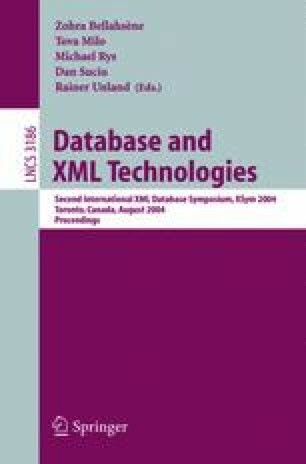 In this paper, we propose a novel technique that uses DTD or XML schema to improve the disk I/O complexity of XML query processing. We present a schema-based numbering scheme called SPIDER that incorporates both structure information and tag names extracted from the document structure descriptions. Given the tag name and the identifier of an element, SPIDER can determine the tag names and the identifiers of the ancestor elements without disk I/O. Based on SPIDER, we designed a mechanism called VirtualJoin that significantly reduces disk I/O workload for processing XML queries. Our experiments indicated that SPIDER outperforms the structural join techniques Stack-Tree and PathStack in XML query processing, especially for XML queries with heavy join workload and large data sets.